Developing a Business Case for ERP Customizations | ERP the Right Way! To customize or not to customize – that is the question which continues to be a source of contention and confusion. On one hand, customization(s) can result in an expensive ERP solution. However, ERP software enhancements can provide a competitive advantage or cost reduction that is customer-specific. The challenge is not in the question itself but rather how the answer is justified. Unfortunately, many business cases for ERP customizations are either too short-sighted or do not fully comprehend the impacts to the ERP investment. In the next section we will discuss the key components required for an ERP business case for customization(s). 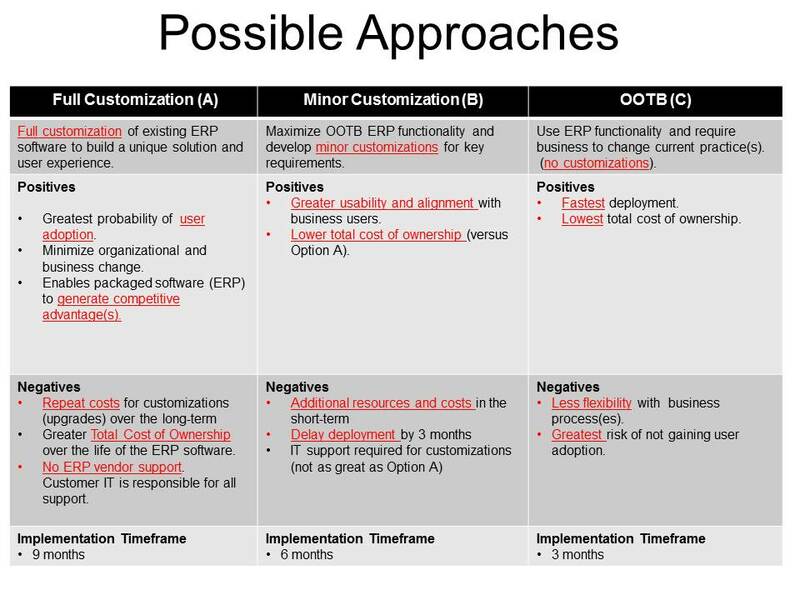 Following is a business case template I’ve used as a consultant to justify ERP customizations. Let’s briefly discuss each section in greater detail. The Problem (or Opportunity) section should clearly define the issue(s) as well as the target audience who will benefit from addressing the problem. The problem section should also explain the compelling reason (s) why the problem should be addressed. The Solution section should speak directly to solving the problem or addressing the opportunity. The solution section must include the method(s) used to validate that the proposed solution solved the defined problem. Moving back to the business case, the Risk Assessment section outlines the risk(s) associated with each approach option defined in the previous section as well as identifying the risk(s) of doing nothing to address the problem/opportunity. The final section is the Value Analysis section. The key challenge I have noted is that short-term value methods (examples: benefit/cost analysis, payback period) are used to support a decision with a long-term impact. In the next section we will discuss the unique considerations one must address in developing a valid ERP software customization value analysis. Impact to Upgrade and Maintenance: What is the impact that the customization will have to the ERP maintenance and upgrade process. Is the software customization intrusive? – Meaning is it an add-on enhancement or a fundamental change to how the ERP software works? The more intrusive the customization is the greater the costs required for ERP support and upgrades. Frequent ERP upgrades are a key strategy for driving additional business value. Impact to IT Resource Sourcing: The more you customize the ERP software the more customer-specific ERP knowledge an IT resource requires to provide an effective level of service. Additional customizations will have a shrinking effect on the IT resource pool and may have the potential of driving up related IT support costs. Cumulative Impact to the IT Footprint: Too often we consider customizations individually and not part of the total ERP software changes made. A field change here or a new application page may not seem like a big deal but you must remember that you must support everything you customize. The above areas will ensure that you generate a holistic set of information for an informed decision. 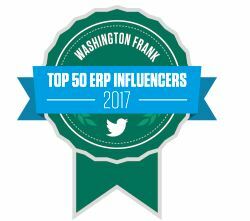 Too often, short-sighted decisions are made to customize ERP without completely understanding the potential impacts. The next section will shed more light on some of the less obvious risks associated with not having a holistic business case. Greater operational costs: There is an additional cost associated with customizations –typically required from the IT organization to support and manage the software changes. Slower deployments of technology: With additional technology dependencies generated by ERP customizations come the additional planning and testing activities required to deploy new ERP functionality. Lost opportunity costs: This is an area that is typically overlooked in customization value analysis. It is more than just comparing one ERP customization to another but also identifying the potential reduction in flexibility ERP software can provide to the business. ERP is a long-term proposition and requires a long-term business case and value analysis for any change in the ERP’s value proposition. Too often decisions on ERP customizations are based upon partial information and are made in isolation. ERP is only one component of a business solution. 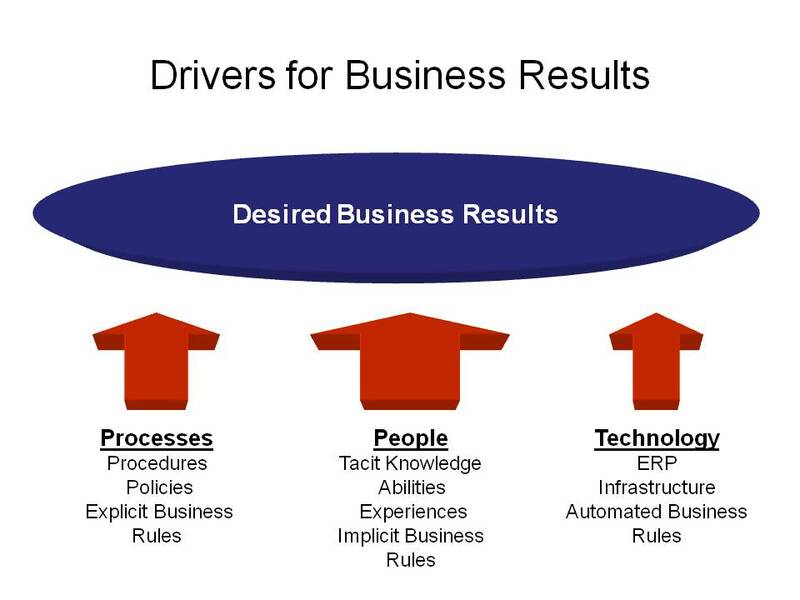 Business processes and People have a greater impact on business results. Granted, the full impact of a customization decision may not be fully appreciated in the short-term but poor decisions will build into a formidable wave that will keep you from experiencing value from your ERP investment. I much enjoyed the logical breakdown, it makes good sense to tackle something in such a step by step manner, thanks for the post. Good article about evaluation of the decision of customization. Just want to add a note for a real world. In my case most ERP customization projects are for small changes to existing functionality like adding new reports, adding new grid columns, adding data validation logic, adding new interface to enter data into existing tables. Not sure if you want to call them customization as well but those projects mostly take less than 2 weeks to implement. Since the ‘small’ customization is not difficult to make or maintain so in this scenario customization should be welcomed if it brings benefit to business. Your graphics are great. 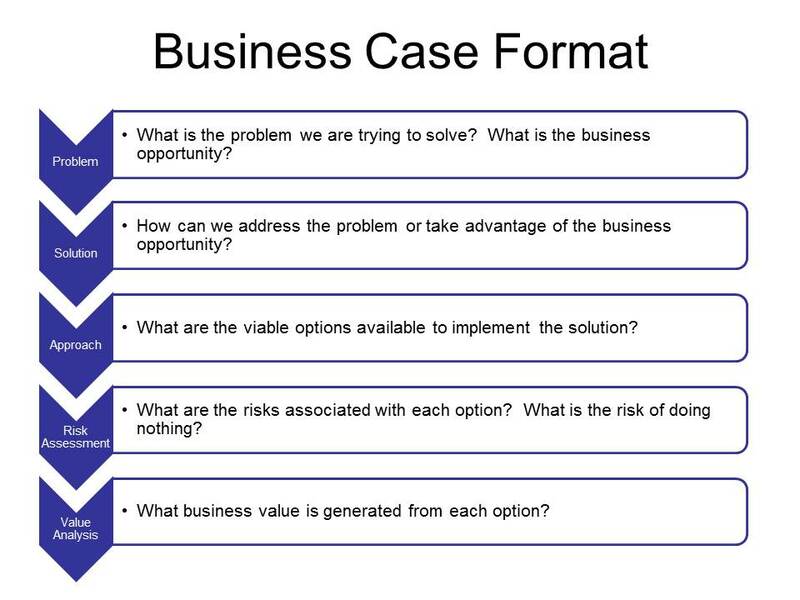 They work as a template for any business case. If you are creating one of these for senior management, you might have to shrink it down a bit. They want summaries, not full explanations. Thank you so much for providing information on ERP Software your blogs are really informative and I have gone through all the blogs posted.